I was taken to a slum in Delhi, a slum of 1,500 families of artists and artisans. As I stepped out of the car, they began singing, children on rooftops, men in doorways, in lanes, everywhere, singing with the hope that their songs would take them out of their extreme poverty; singing, laughing and crying, their art, craft and helplessness contained in one impassioned offering … it was a very moving experience. This was the first meeting between Indian theatre director Roysten Abel and the ethnic, itinerant Muslim musicians of Rajasthan’s Thar Desert. I was totally seduced, said Abel. I wanted to translate this seduction into a physical realm. That seduction, now called The Manganiyar Seduction took three years to conceive and perfect, a sensual extravaganza of theatre, music, installation and pageantry. 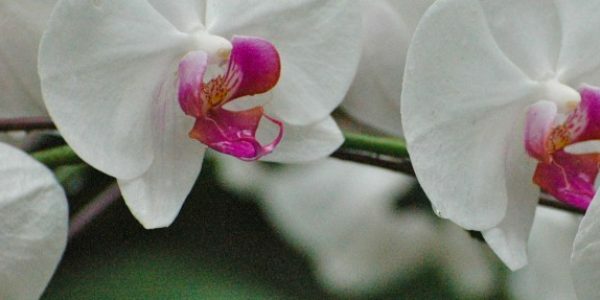 That seduction was first presented to the public at the Osian Film Festival in 2006 in New Delhi and has since then, successfully – and to great acclaim – toured Europe and Australia. They performed in Singapore at the 2010 Singapore Art Festival, their first Asian performance. How do they seduce ? Through spectacle, primarily. Thirty six red curtained cubicles or boxes stacked one on top of the other in four rows, each framed by lights, each containing a musician. The musician may be young, he may be old and bewhiskered or he may be somewhere in between; he may sing, he might play an instrument, he might provide counterpoint, he might challenge, he might lead. He reveals and hides himself, taking centre stage or courteously relinquishing the spotlight; lushly red velvet curtains swishing shut and swishing open. 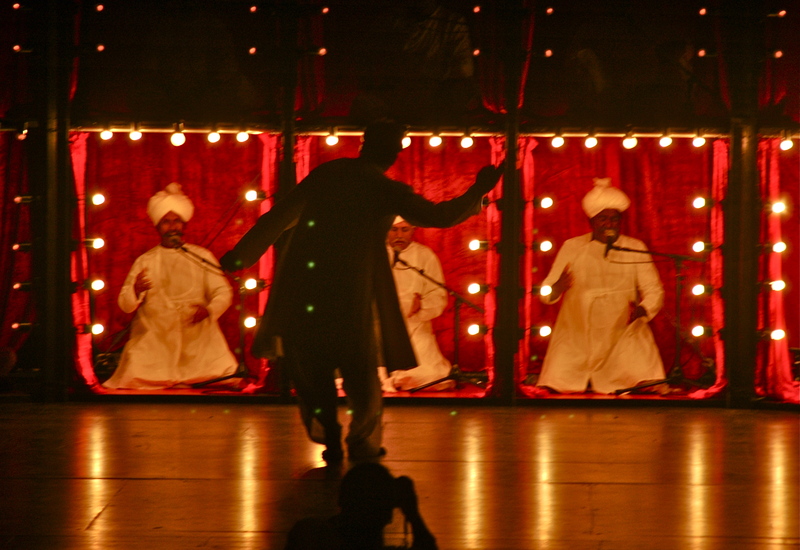 The performance surges and ebbs around a song, a main song, a Sufi song by Bulleshah, Alfat Un Bin In Bin, which has been rearranged to accommodate two other songs, and it becomes a cyclic spiraling dramatic narrative of the dance of delirium which Bulleshah performs to reach God. 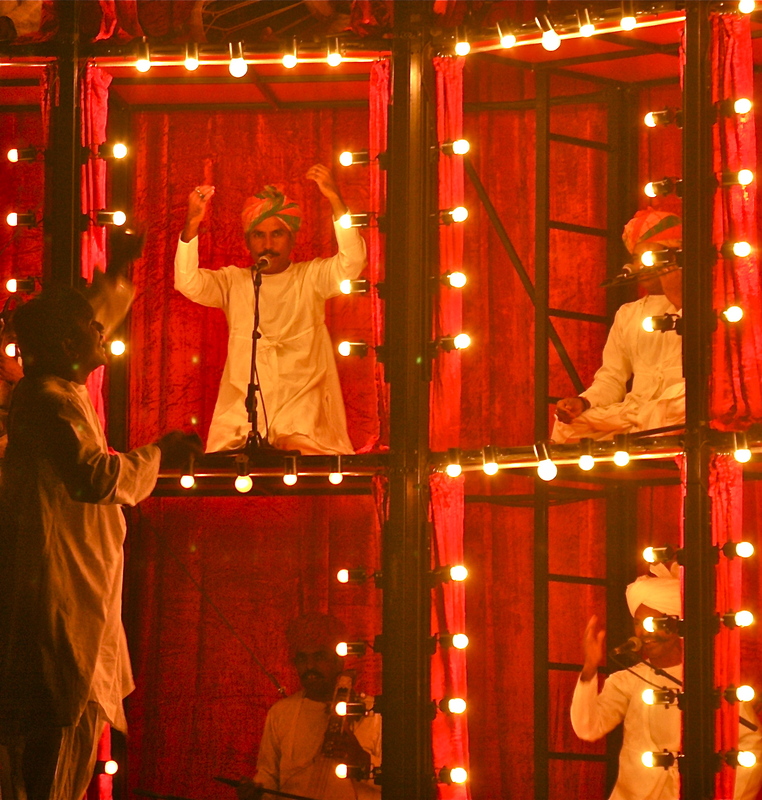 This delirium finds its momentum and rapture in the coaxing and challenge of conductor Daevo Khan, a silhouette in flowing cotton for most of the show; he listens, he asks, he demands, he teases, he provokes and summons full-throated song and the singers rise to their knees and lift their arms into the air, their hearts and emotions filling the space; he whirls like a mad dervish whipping the rhythm into a mad, exuberant euphoria with his wooden castanets, and briefly, he is in the spotlight, facing the audience, questioning, teasing, offering, demanding involvement. Which the audience gives, instantly, unstintingly, which – if you pause to think about it – is the seduction, because the music is incomprehensible (the lyrics are in Marwadi and Sindhi) and no one except the musicians understand their song, but the emotion and passion touches everyone and they respond from deep within themselves, and that is the seduction, the tapping into a universal psyche of longing and joy and pain and seeking that every human being understands. 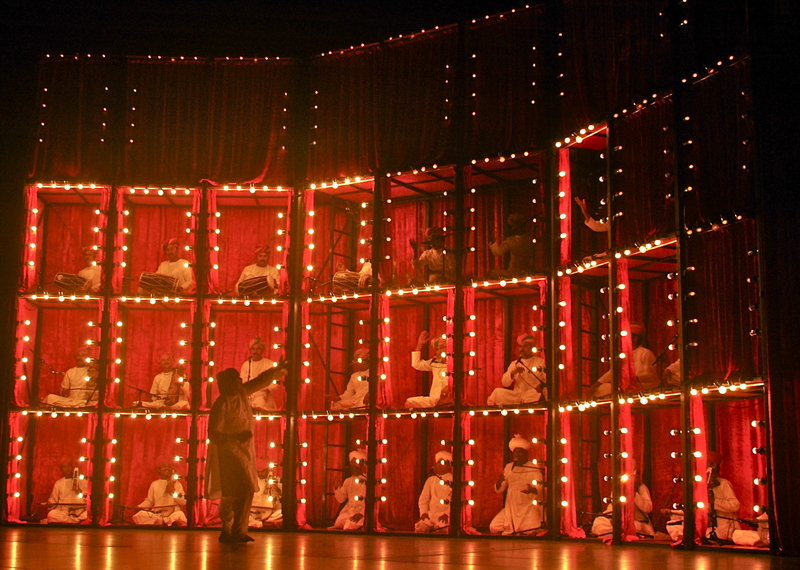 The visual part of the seduction is open to interpretation – the red curtained boxes could be a reference to Amsterdam’s red light district, or to the windows of Indian palaces where women folk would view ceremonies or processions while unwittingly becoming the subjects of voyeurism themselves (Abel), or they are magic boxes of surprise and delight, or a frame showcasing talent, or even a mirror – because what you individually and uniquely perceive reflects a part of yourself. One cubicle lights up, as the first singer begins his song, then another, and a third, one dims and a row lights up; this carefully choreographed interplay between light and song underscores the dramatic build up of instruments and singers, and the finale is an explosive onslaught – heart, thought, mind, rhythm, voice, tempo, music, spectacle, glory, awe, ovation. Who are the Manganiyars ? Hindus who converted to Islam when Sufism came to India, becoming a caste of Muslim musicians (who worshiped Hindu deities), they are an itinerant ethnic community. 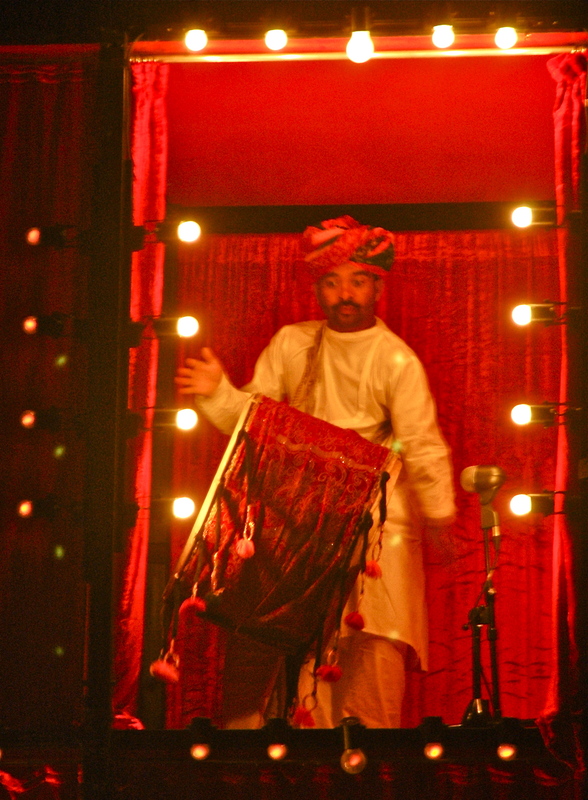 They traditionally performed for their patrons, the kings of Rajasthan. The Manganiyars were obliged to sing for their patrons – who were obliged to look after them; a traditional system of obligation and responsibility between patron and performer that endured, till the patron became anyone who could provide them with a meal. Their repertoire is wide and encompassing – from ballads about kings to Sufi poems written by mystics – as they sing for various auspicious occasions – births, marriages, feasts – even for rain. Theirs is an entirely oral tradition, not a note or a word is put to paper and the singing is passed down from generation to generation, family to family. Though classified as folk, their traditional music is classical; the Manganiyars mine the rawness of ‘folk’ and the complexity of ‘classical’ to create a special music imbued with the resilience of the nomad and the curiosity of the wanderer. 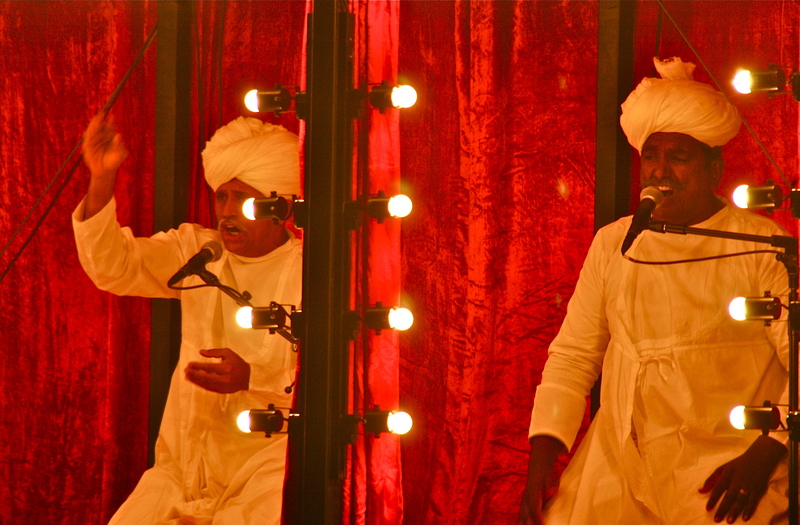 With their white cotton robes, brightly coloured turbans, tasseled instruments and unrestrained singing, these men of imagination, vision and artistry perform with a rugged passion that evoke the undulations of desert dunes and the bright, hot colours of Jaissalmer, Barmer and Jodhpur. Based out of Delhi, Abel works with a group of fast-disappearing ethnic Indian artists – street performers, magicians, jugglers, impersonators, snake charmers, acrobats, musicians, puppeteers – to preserve and perpetuate an ancient and largely undocumented cultural heritage threatened by all that is contemporary and much that is Western. Contemporary India is not necessarily a contemporary ‘Westernised’ India, he believes, in the realm of theatre and art and culture we need not look westward, but within. His other production, A Hundred Charmers, features performers from the community of snake charmers seeking a new vocation after the Prevention of Cruelty to Animals Act forbade them to perform with their snakes. Focusing on their flutes or magadis, Abel brought them together (and embellished their performance with the odd Scottish bagpipe) to create an experience of ancient tunes, melody and heritage, which he hoped would be grand, but turned out to be celestial. On the Manganiyars, Abel says theirs is a relationship of understanding and trust, and even after hearing them a thousand or more times, he is still seduced by their music. Anyone would be, listening to him describe a night in the Thar Desert, this group of men singing through the night, alcohol, poetry, heritage and a cold breeze, the clearest of night skies thick with stars, hanging low enough to pluck. Sometimes, he smiled, you have to beg them to stop singing. 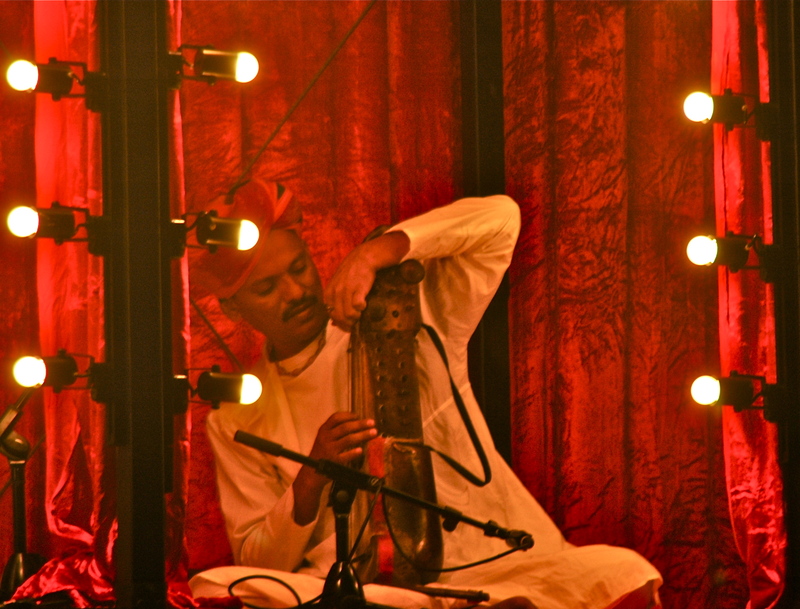 The Manganiyar Seduction, featuring almost the same group of musicians, will be on tour till September 2012. Next Post Corsican candied clementines, anyone ?